Last weekend I went to Rick and Su’s for dinner. 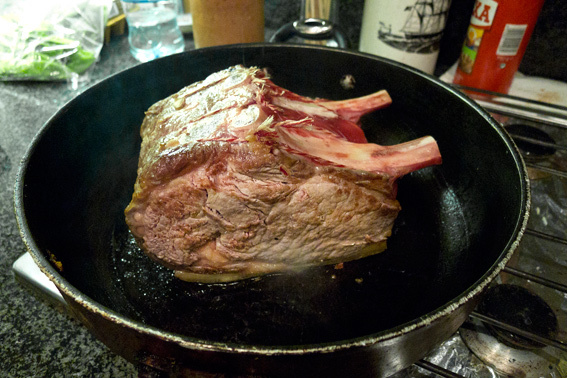 Rick bought a 4lb Fore Rib of Beef from Waitrose – who do sell very good roasting joints. 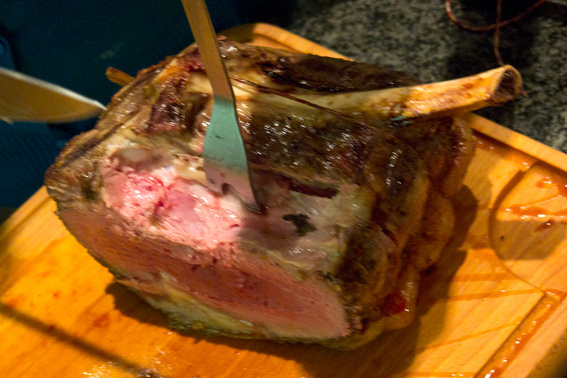 Note the marbling (little veins of fat) in the meat. 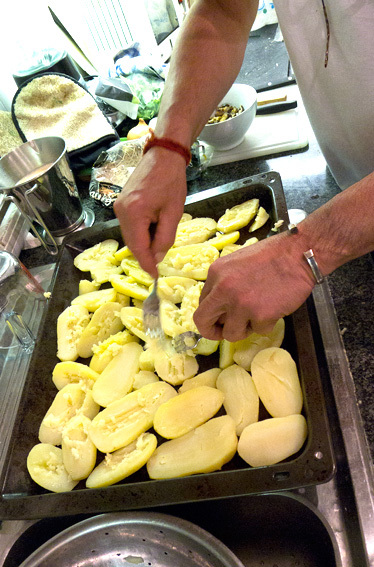 The fat contains the flavour, so having it spread out through the meat enhances the taste throughout. There’s also a nice layer of fat on the underside. 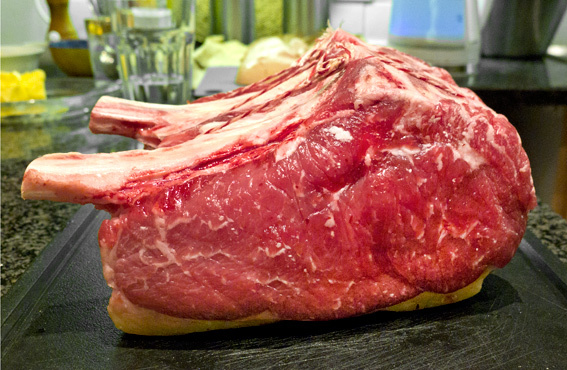 The Waitrose butcher had gone to the trouble of French Trimming the bones (cleaning them off at the ends) – it’s cosmetic, but it looks nice. 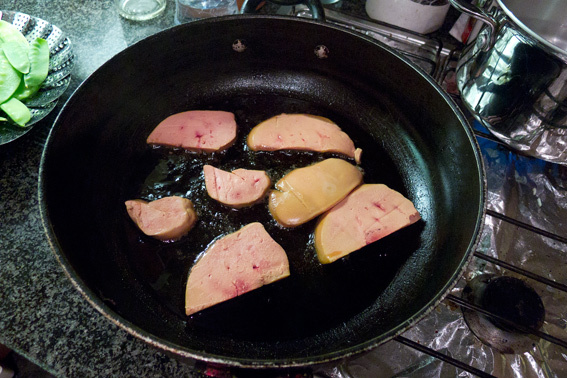 I brought a whole duck foie gras, which I sliced with a hot knife and warmed quickly in a frying pan – it only require minimum cooking or it will literally dissolve in the pan. 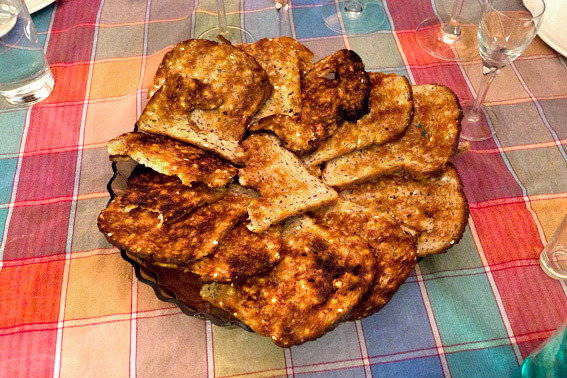 The foie gras was served on Melba Toast– patiently prepared by Su and Rabina. The beef was seared to caramelise the outside and improve the flavour. I deglazed the pan with red wine and poured it over the top of the joint, before roasting it in a hot oven for an hour. 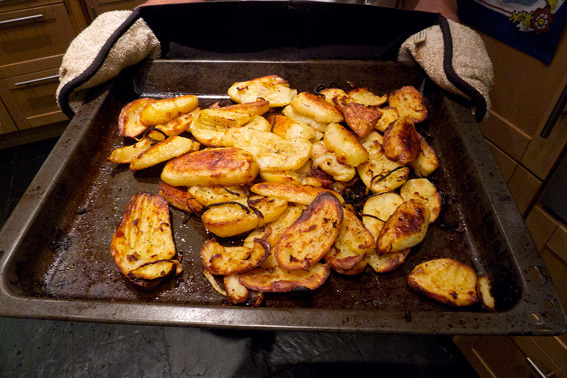 before scoring and roasting them with slivers of onion. 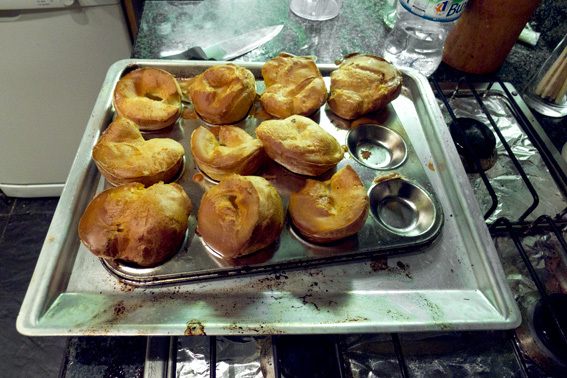 Su whipped up (literally) some batter and poured it into hot fat in two oven trays, to make beautiful Yorkshire Puddings. The fat and oven must be hot if you want your puddings to rise. After an hour in the oven, the beef was covered and left to stand (this allows moisture to be reabsorbed into the meat, improving the texture and flavour) for half an hour. 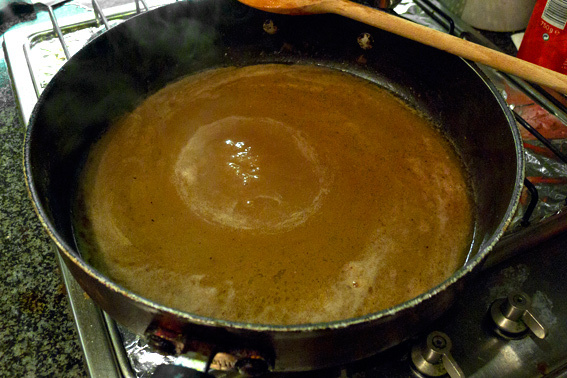 During this time I made gravy with the foie gras fat, beef juices in the bottom of the oven tray, plain flour and water from the vegetables. The foie gras certainly made the gravy taste rich! To facilitate carving, it’s best to remove the bones first. 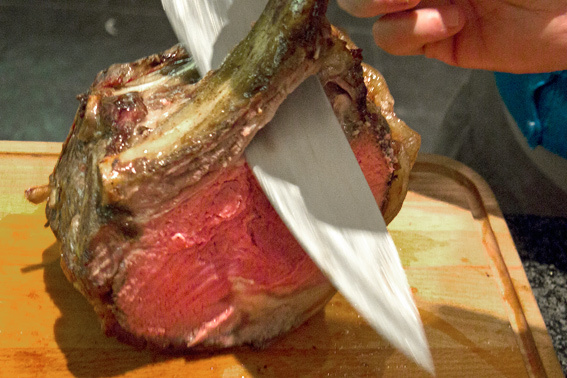 The beef didn’t stand a chance – between 6 of us the meat disappeared in a flash! I think that just shows how good it was. 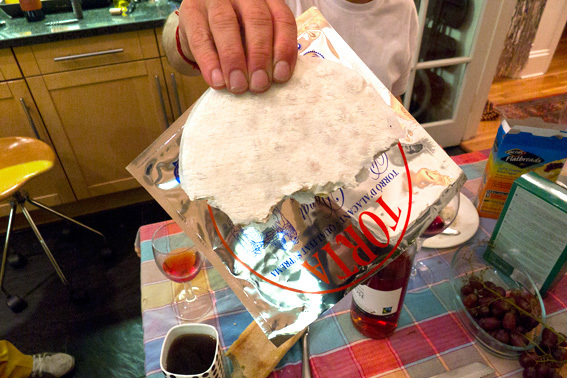 then Rick found some Torta (Torró d’Alacant) – some delicious torrón he’d bought in Barcelona. Torrón is a nougat like sweet, made from honey, sugar, eggs and almonds – it’s very popular in Spain and Italy, especially at Christmas. This entry was posted in Barcelona, Eating Out, Food, Meat, Recipes and tagged beef, cheese, foie gras, fore rib, gravy, melba toast, roast potatoes, torrón, Yorkshire Pudding. Bookmark the permalink. This looks incredible. I adore beef and this is exactly how I like it cooked. 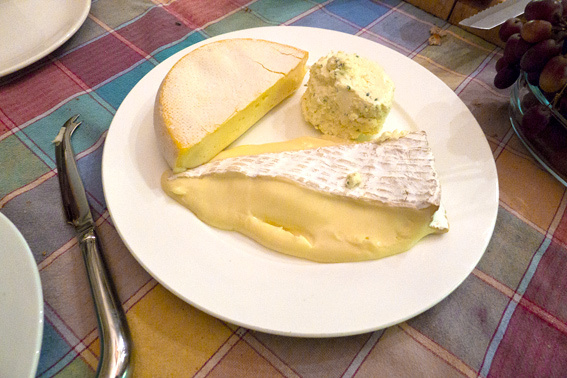 And then you go and torment me further with foie gras and cheese almost melting off the plate. That´s just cruel! I was just going to say more or less the same as chicaandaluza! What could be better than this dinner?